For a big group – Set your camera to landscape (to make sure all the people and the tree are in focus). Give yourself plenty of light too! If it’s not bright enough in the room, turn on the main light or use flash. For smaller groups try portrait mode, again plenty of light is key! Move nearer the the window if necessary. All adults need to push their chins forward and down for a flattering portrait! Think of it like this: push your forehead towards the camera – it takes years off you in a photo! Turn slightly sideways onto the camera -don’t face the camera square on. Turn 45 degrees and you’ll look slimmer! Get ready to enjoy better selfies! P.S. Now, you know as well as I do that group selfies are tons of fun, but for some uses they aren’t quiiiite the same as a photo someone else took. 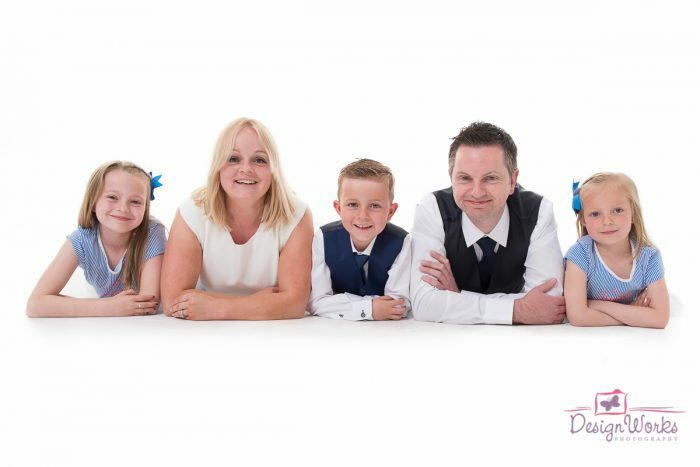 If you’d like at least one family photo that doesn’t include anyone’s arms sticking out of the side of the frame, and you want someone to take it who knows how to make everyone look fabulous, here’s an easy way to get one: we have a great offer this Christmas for a one hour family session plus a 20″ wall portrait (as a fine art canvas or an artblock) for just €250 (save €130!) Get in touch on 018021100 or email bronagh@designworksphoto.com to grab one!